Several weeks ago, I wrote about my first experience with soft weights. I had to construct a fake curved spine for a box. It is not possible to use flat weights to press a rounded surface and I had to find some other solution. On our kitchen, I found two synthetic fiber bags and filled them with rice and buckwheat seeds. It worked! I don’t like my initial design because rice and seeds tend to attract some nasty kitchen bugs. The idea of my experiment was to use some inconsumable stuff. With exception of salt. The bags I have used for my first try were soft and sturdy at the same moment. That’s why I’ve spent some time trying to find the material they are made of. It appeared to be spunbond – a nonwoven synthetic fabric. They are sold in many densities ranging from thin fabrics used for greenhouse insulation to thick sheets used for building insulation. My first three weights were filled with BBs (round, steel, copper coated), lead shot and sand. The first bag had only two layers of spunbond – you can even see the copper spheres through the fabric. Even with not-so-heavy 2-kilogram weight filled with BBs it seemed I could tear through the fabric at any moment. Lead is 50% heavier than steel, and I have decided to make a fail-safe bag, folding the fabric to form four layers. However, even four-layer bag wasn’t fail-safe for the sand. After I have filled my third specimen, I felt small particles on my fingers. 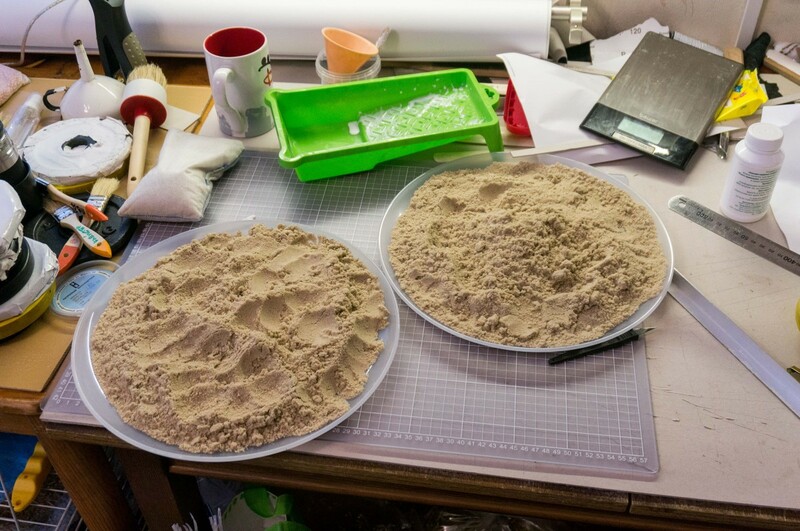 Just in a few moments all my working area was covered with sand. I was advised by my readers to put a zip-lock bag filled with sand inside the fabric bag, to prevent spillage. I have tried to laminate spunbond and polyethylene with my ironю However, with no luck. It either would not stick (not hot enough) or fuse with outside layers of fabric I’ve put to protect the iron (too hot). Anyway, it seemed to be too troubling to spend time on that process. For my third approach to the soft weights filled with sand I’ve used a tightly woven fabric (viscose + synthetic fiber in some proportion). To the moment, it is the best design. Four layers of that fabric prevent spillage very well. Even after using, lifting and dropping the weights (I’ve made several more of them) for several days there was no sign of send anywhere around my working area. I’ve also made two bags with viscose fabric layered with spunbond and filled them with sand – that worked well too. However, I’m not sure why I should use that type of layering, while viscose fabric works good alone. In the right bottom corner you can see an empty bag. Salt and sand bags are pretty indistinguishable. Even the weight difference is almost nonexistent. I suppose the 50 gram variation between the sand weight and the salt weight may be the result of not filling the bag properly. Exclay is very light weighted (being Captain Obvious). Even while I’ve used one of the smallest fractions of expanded clay. 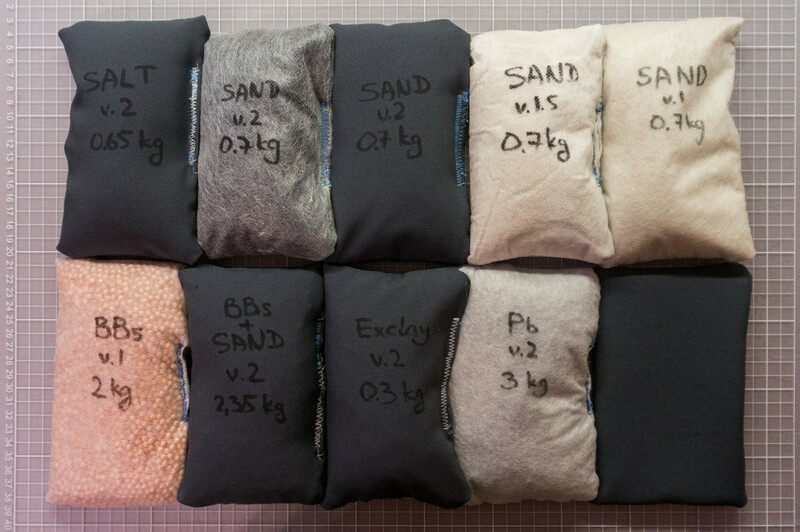 The same bag that weighs 2 kg filled with BBs, 3 kg filled with lead shot and 700 g filled with sand or salt, weighs only 300 g filled with exclay. However, it may be reasonable to use ecxlay for larger bags when you need to apply some pressure on the large surface but the shots or even the sand would be too heavy. The other failure was the weight filled with mix of sand and BBs. It is only 15-20% heavier than original weight filled with BBs, but the process of filling the bag with the mix was painstakingly difficult. All the four-layered bags were made with pieces of cloth 20×40 cm in size. 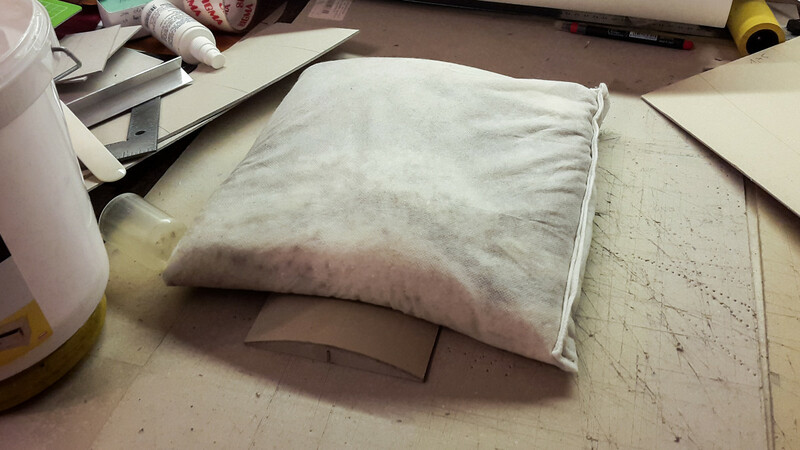 For the last part of the experiment I’ve made a larger bag with a square of cloth 40×60 cm in size. 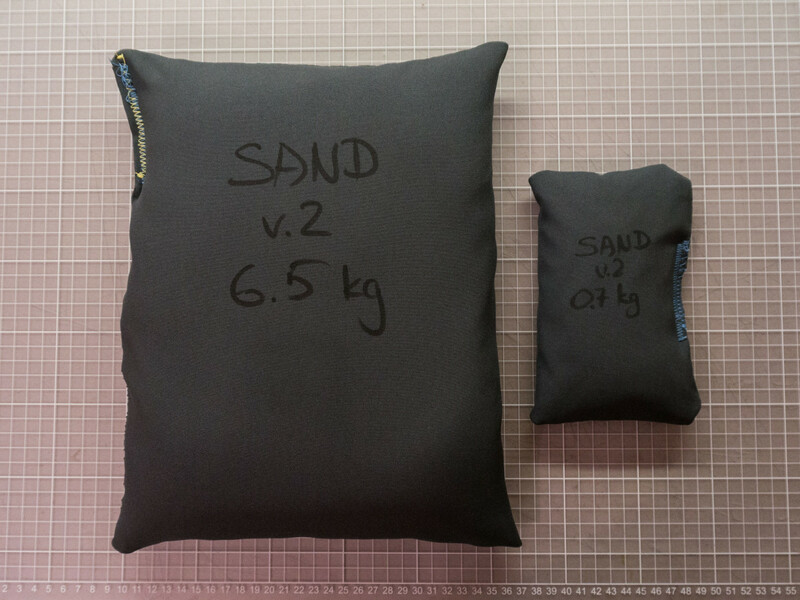 This volume allowed to make a weight more than 9 times heavier than the original sand bag (6,5 kg). As for my personal experience, I like both sand/salt soft weights and ones filled with BBs/lead shot. I’m not sure about usefulness of the weights filled with exclay – I will try to make larger weights later. On the photos above, you can see not only small but also large pieces of expandable clay. I have decided against using that material, because I’ve had enough experience with small exclay for now. Unfortunately, ceramic balls are too expensive and hard to obtain here in Russia. 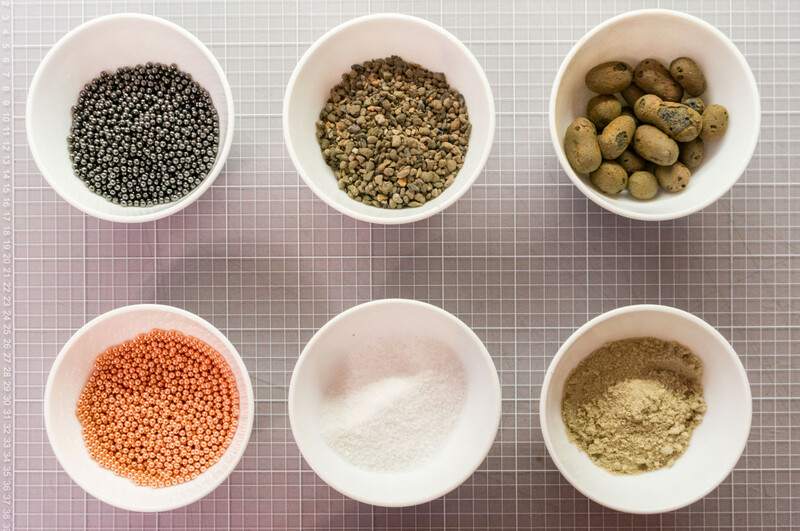 As for the dry beans, I decided not to use them for the same reason that drove me to start that experiment – I’m not sure if they attract kitchen insects or not. I also have some concern about the weights filled with salt. There may be some problem if they are placed in humid conditions. Unlike sand, large pieces of salt are pretty hard to be smashed back in small pieces again. I hope my research would be useful for you. If you have anything to add, please leave your comments below!